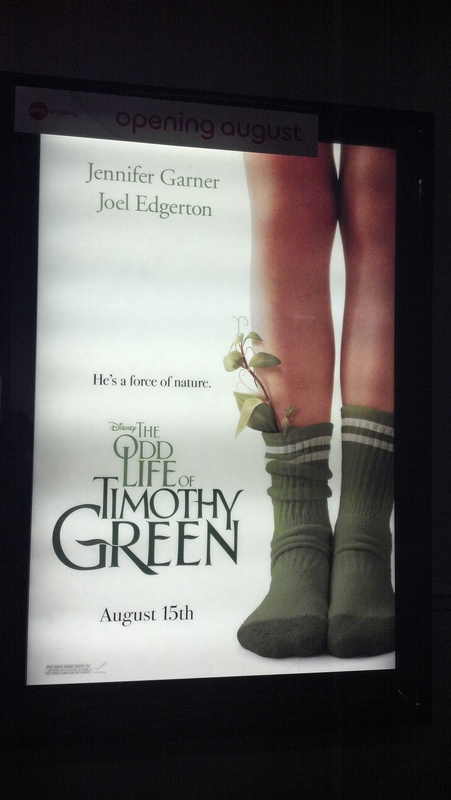 The Odd Life of Timothy Green is the latest Disney film which promises a lot of heart to it. Unlike most of the movies released this summer, this was an original idea thought up by writer Ahmet Zappa. Movies that tackle touchy topics like this have a hard enough time finding the balance in how it treats a certain subject, much less a family centered film. Can The Odd Life of Timothy Green be that rare film that balances its treatment of a touchy subject yet and still be entertaining? Joel Edgerton and Jennifer Garner play Jim and Cindy Green, who are at this time before an adoption representative, pleading their case as to why they should be adopted parents. After the couple receives word that they are infertile, they are heartbroken. In their last effort to let go of their desires to have a kid, they end up writing down the attributes that their kid would be like. Upon finishing, they put it in a small box and then bury it into their garden. After an impromptu rainstorm, the couple is surprised to find that the contents of the box of actually materialized into a real boy named Timothy (played by CJ Adams). As Cindy and Jim learn how to become parents by raising Timothy, they come to find that Timmy is having an effect on everybody he comes in contact with. The acting in The Odd Life of Timothy Green was very talented. Joel Edgerton and Jennifer Garner were able to have great chemistry together as parents trying to maintain a sense of normalcy despite the bizarre situation that is happening. Young C.J. Adams was completely charming in the title role. He played the role so well you can’t help but like a kid. In fact although I find the concept a bit weird, the chemistry between Adams and Odeya Rush’s character Joni Jerome what seemed interesting. This movie also features performances from Rosemary DeWitt as Brenda Best, Cindy Greene’s competitive sister, musician Common playing Coach Cal and a flawless performance by screen veteran Dianne Wiest as Ms. Bernice Crudstaff, Cindy Green’s intimidating boss. This movie featured great performances from actors whether they were some relatively new or experience on the screen. Of course, the movie has positive messages regarding individuality, parenting, & life in general. Despite this great acting & positive messages, this movie feels very hollow. Although I understand that’s it’s a family movie, the story is all over the place. On the one hand, there are few story points that seemed contrived and incredibly unrealistic. (Besides the fact it is a movie that a small child was found in a garden; I was invested in that) This is a spoiler since this is a spoiler free review I won’t get into detail about what parts bothered me that says something that I noticed. There are times where I felt that the movie tone came off either pretentious or too serious unnecessarily. It got to the point where I was wanted to say to “Get over yourself & relax a little bit. Just tell the story & everything will work out.” However, in the sense that movies are like children, no child is perfect. This movie does have many great moments and also is the moral tale regarding important lessons regarding individuality, parenting, and just life in general. With lessons like this, you can tell that this is a movie that means well.